I am so thrilled my friend, Joseph Pistrui, agreed to post on my site. Joseph is Professor of Entrepreneurial Management at IE Business School in Madrid, Spain and in the IE-Brown Executive MBA program as well as Visiting Fellow at the London School of Economics and Political Sciences. He just started a must follow blog, Nextsensing, to help entrepreneurially minded leaders make sense of "disruptive ambiguity". One of the things I admire about Joseph is his ability to simply and clearly communicate the complex and ambiguous. Enjoy! I know you will and definitely follow him at @nextsensing. All business leaders say that they want their businesses to be competitive. It’s not unusual to hear that they have set “ambitious,” “aggressive,” or even “audacious” goals for their companies. That’s great — as long as they are also aspiring. Aspiration, however, is tricky when it comes to management. The reason for that is in the root definition of the word. To aspire inevitably leads you to the word hope, and you’ve probably either heard or spoken the phrase “hope is not a strategy.” Yet, the state of the business world today is one of enormous disruptive ambiguity, an incoherent jumble of trends, headlines, opportunities and threats. In such a state, it’s increasingly difficult to answer even the most basic questions about your own business. The marketplace seems, to many, a swirl of new competitors (is Apple soon going to be making wristwatches? ), new risks (will the price of oil plunge or soar? ), and new challenges (what new government regulations will we face next month?). As a result, few, if any, business leaders speak with rock-hard confidence about the probability of success for their own firms (other than on some public relations platform). One reason for this is that few business leaders seem to feel certain about the integrity of their customers’ baselines for probable future success. Simply put, whenever someone’s future is ambiguous, their mind is usually disrupted by fears. So, they set goals. And, sometimes, they hope. In fact, hope can be a winning asset when viewed as an aspiration to do something extraordinary, to discover something new, or to generate a key insight that can set new actions into motion with enough confidence to persevere. Hope is also a required ingredient when one is engaged in nextsensing. Nextsensing is a process that I have been refining for several years. It’s a structured yet open-minded way for leaders to think forwards, not backwards. Too often, people confront a problem (such as defining a credible business strategy when the future is a haze) by trying to solve it by facing backwards. The default impulse for many leaders is to employ techniques learned in the past, to come up with solutions designed to return to the way things were before they had to confront a new and challenging future. For example, if sales are sagging this year, many executives fall back and use the same techniques they used last year when sales were more robust. (“Let’s do what we did last year — only faster!) It’s as if, when lost while driving, they can get back on track simply by increasing their speed. However, thinking backwards lacks aspiration and, as a consequence, blocks (intentionally or otherwise) the necessary foresight to keep pace with changing times and to find new ways of doing business. It’s a form of wishful thinking rather than novel thinking. Remember Napster? It introduced a platform for users to trade digital music files across the Internet, and the recording industry scrambled to shut Napster down. Instead of recognizing the critical digital shift in the world of music and attempting to find a way to capitalize on that new reality, the industry sought to stop file sharing. By contrast, the industry could have engaged in a process that (1) honestly and objectively observed conditions as they are, not as one would wished them to be, (2) organized these observations into patterns and insights — pivot points for moving in new directions, and (3) originated a novel point of view, one that listed any and all interesting and emerging possibilities. These three steps (observing-organizing-originating) are the heart of the nextsensing process, which strives to leverage our cognitive, emotional and social capacities to unravel new meaning from current data and events. When engaged in nextsensing, we are interested in unlocking the meaning hidden in the ambiguity of a promising opportunity. 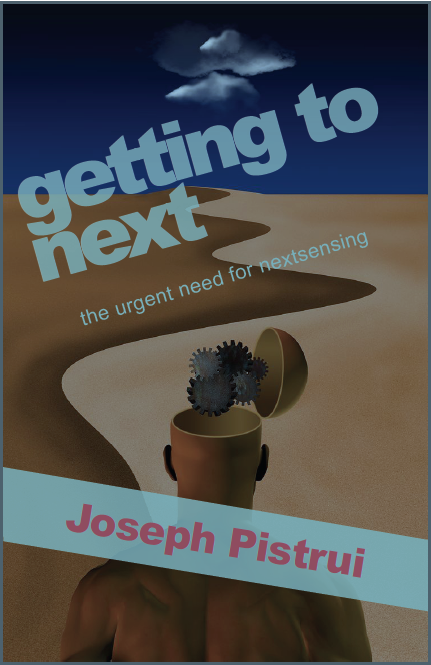 In short, nextsensing is about converting confusion into clear thinking. Only then can business leaders evaluate the full range of potential opportunities inherent in an evolving market. Imagine how the state of things today might have been different if the recording industry had invented first what the world now knows as Apple iTunes. The recording industry then — and many other industries now — will never succeed by driving their status quo vehicle faster, by setting goals that attack their problems in a backwards way, and by deep discounting the hope inherent in aspirations. Thus, the counterweight to disruptive ambiguity is opportunity foresense. I urge leaders and their management teams to use a simple Opportunity Canvas that reduces their critical need to observe-organize-originate to a one-page thinking exercise. The amount of paper needed to catalog new thinking may be slight, but the task itself is as big as the available collective knowledge base and imagination reach. This is why I urge leaders to aspire whenever they set goals. When the hope for something new or something better (even something that may never have been done before) is integrated into a disciplined thinking process, finding one’s next is a hopeful process of discovery.